Diamond 5 stone bar set ring, 1.50cts 18ct gold mount - Connard & Son Ltd. 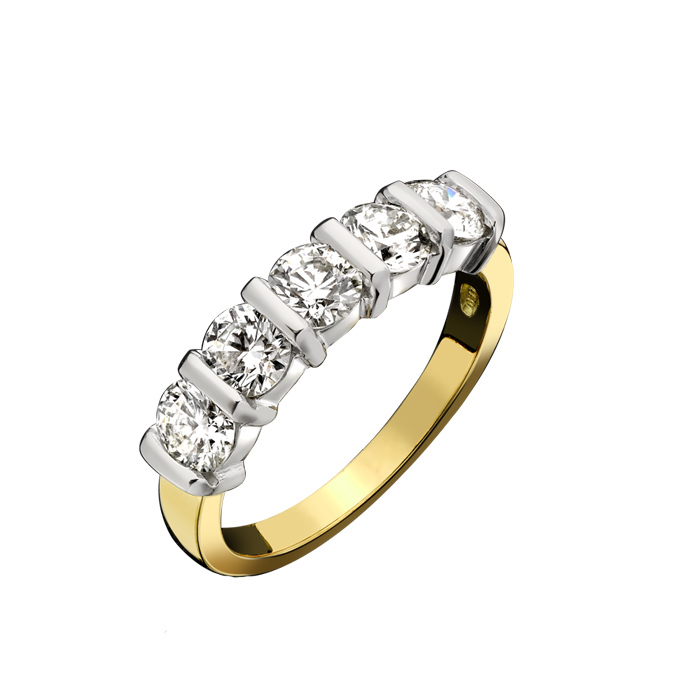 The bar set rings we find to be very popular, especially in the larger size of diamonds because they cover the finger from one side to the other and look very nice just worn on their own. This ring has 5 modern brilliant cut diamonds all of equal size, they are then held in place with an 18ct white gold bar, these are quite substantial and can be hard to set the diamonds in, however once made they have a lovely smooth finish and the diamonds are extremely secure! The settings are made in 18ct white gold, with the 18ct yellow gold shank having a slight taper to it from the diamonds to the back.